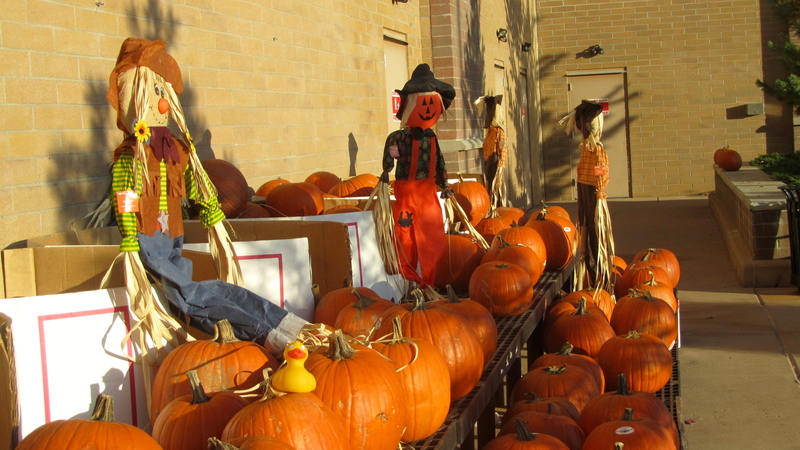 Monday I, Zeb the Duck, showed you pictures of pumpkins, lots of pumpkins, and photos of Halloween decorations people had in their yards. This Halloween is so exciting. But I didn’t know all of it. Mom and my Alaska uncle took my Alaska cousin and me, Zeb, trick or treating. It was so much fun. We went to houses and said “trick or treat” and the people gave us candy. Fantastic! This is what we brought home. 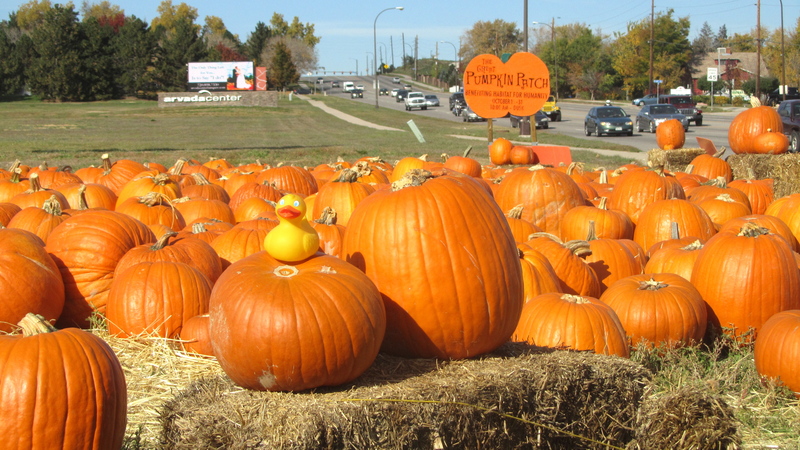 Halloween is a great holiday for kids and ducks! Wish Halloween came more than once a year! Zeb the Duck here. Things have changed. Remember I was just born this summer. Nights are cold. We have had some snow. Leaves turned colors and are falling. 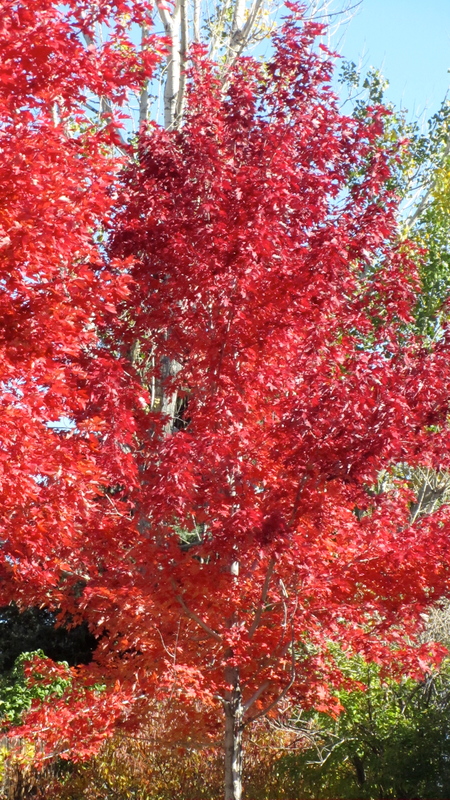 I saw many gold leaves; now these red leaves. 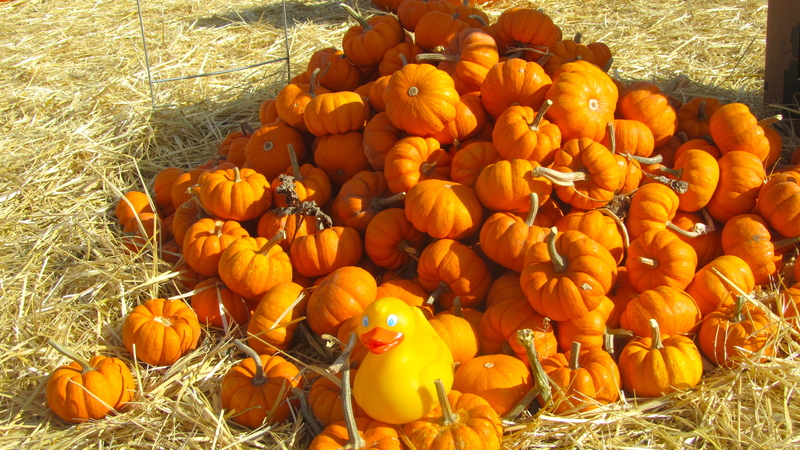 But, what is with all the pumpkins? 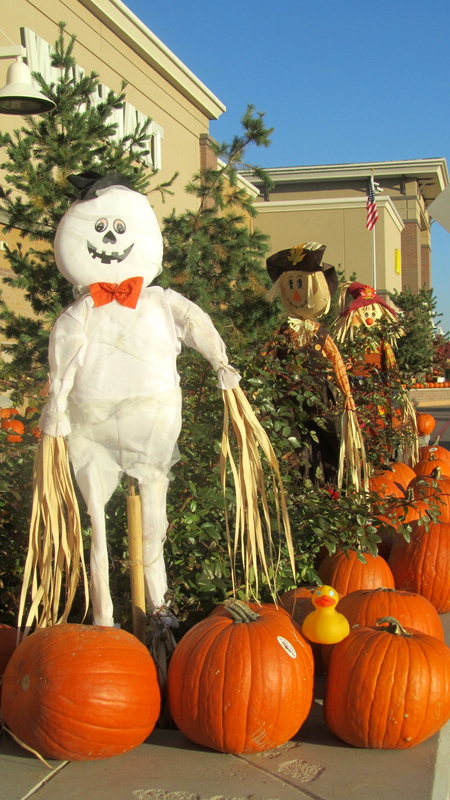 We went to the store this week and so any pumpkins, scarecrows and ghosts in front of the building. Mom bought some pumpkins and then went back and bought some more. Driving home, we saw lots of pumpkins on the ground. Pumpkins being sold for Halloween. Lots of pumpkins. Some are so big and then we found these that are my size. Some people decorate for Halloween. 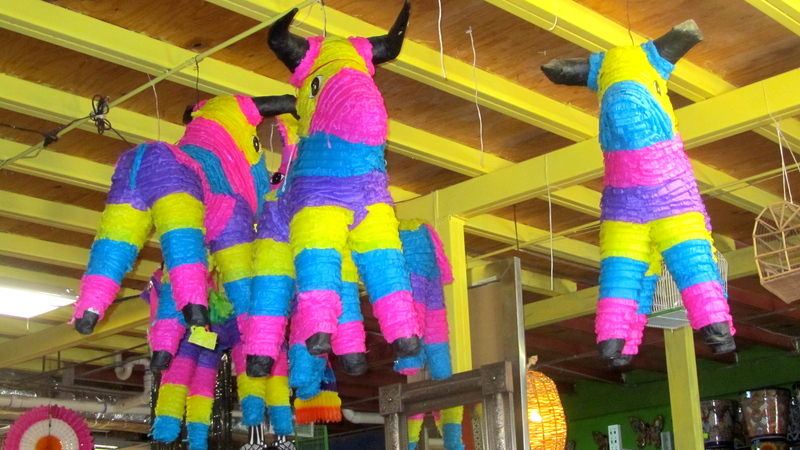 These are great decorations. 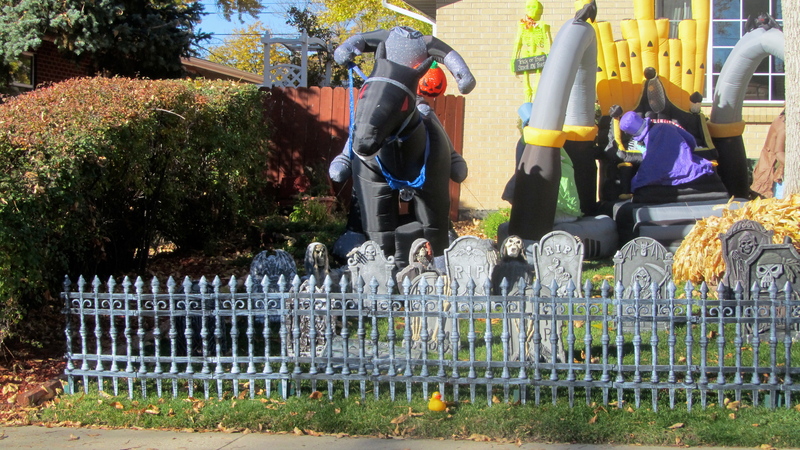 Here is the headless horseman riding toward grave markers. 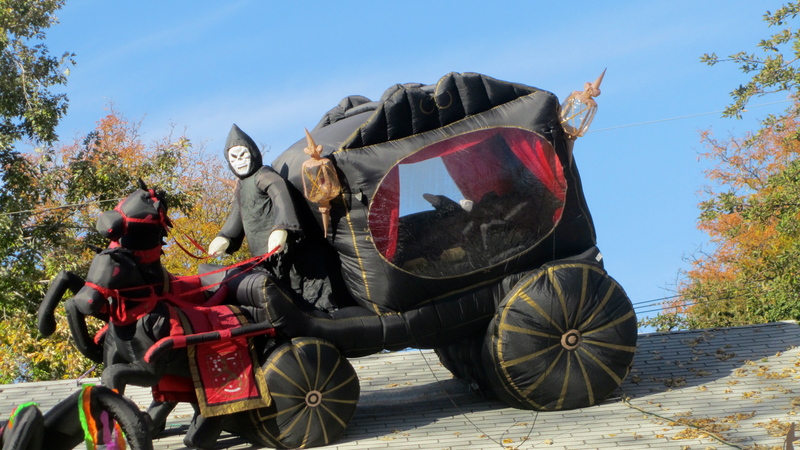 Here is a carriage and it is on the roof of the house. Mom says that this Thursday is Halloween. 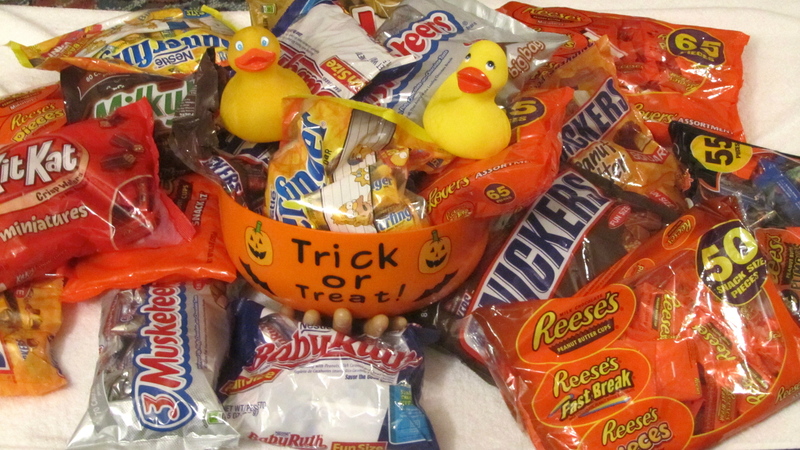 On Halloween kids, many with parents, will wear costumes and come to houses and say “Trick or Treat”. These kids will expect us to give them candy. What a great day for kids. Again, I wish I were human. I am looking forward to Halloween to see all the action. Strange human behavior, but I, Zeb the duck, like it. 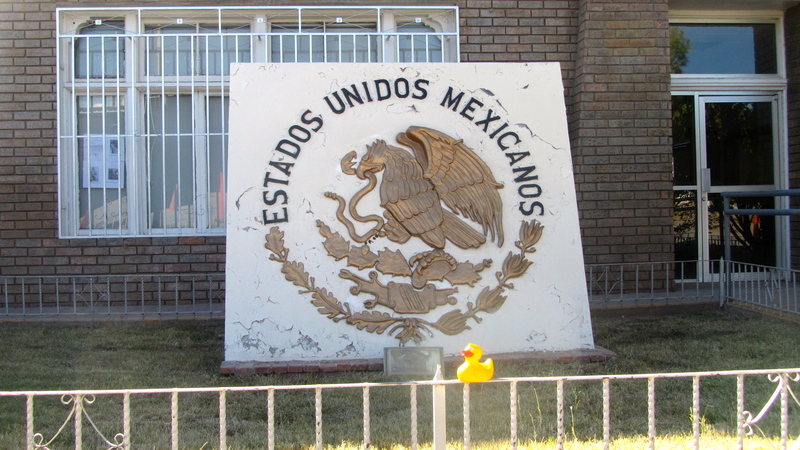 I, Zeb the duck, am still excited about visiting Mexico for a few hours. 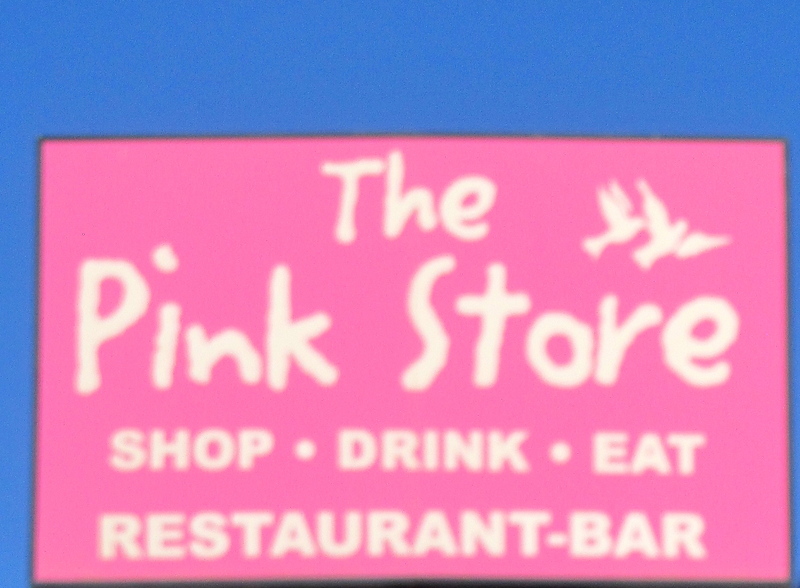 Yesterday I told you about the Pink Store in Palomas. 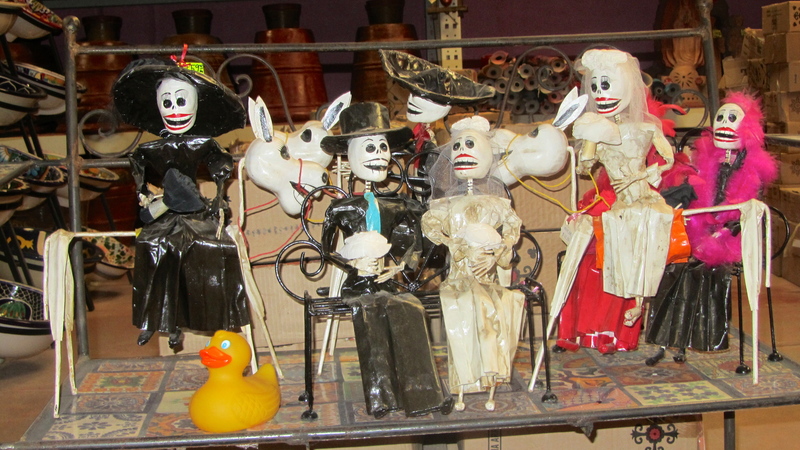 It was fascinating and had skeleton items for Mexico’s Day of the Dead. If you missed my experience, please go back and read it. I love that store. 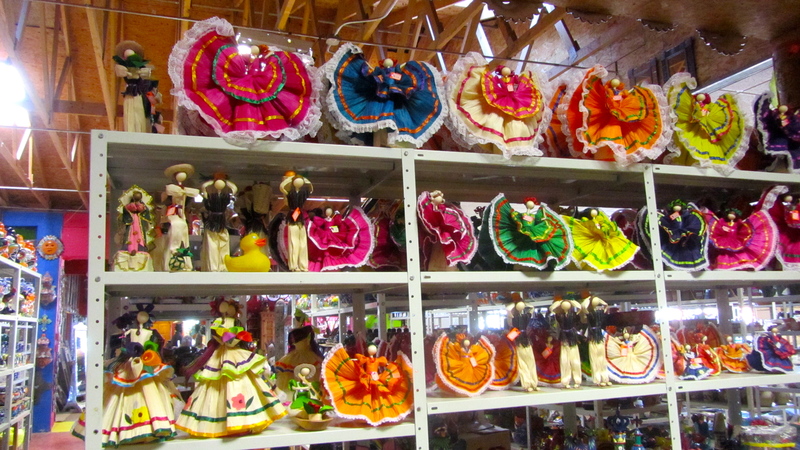 But, as much fun as shopping was for me, there are other parts of Palomas. There were a few other stores. There are liquor stores and pharmacies. We did talk to a few street vendors. One man was selling sunglasses, another sold straw hats and another sold DVDs and CDs. There were more restaurants in town. They had a tempting aroma as we walked past. We eat a lot, but one lunch was enough. These ladies were dressed up and looked very nice. Thought you would like to see them. 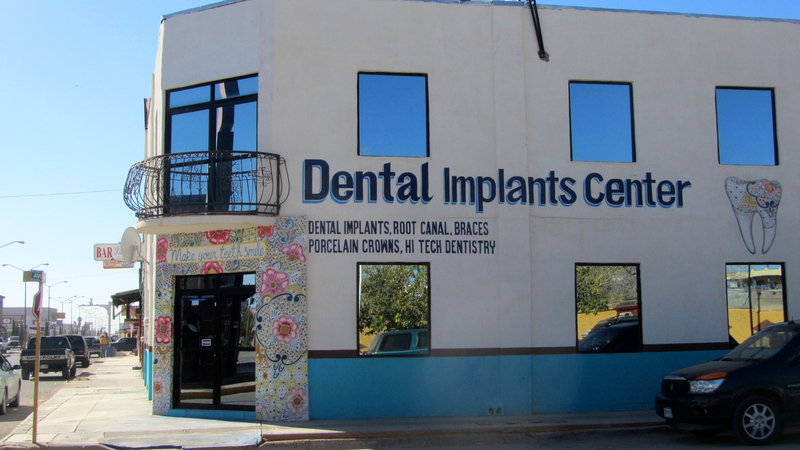 I did see a lot of dental and vision offices. 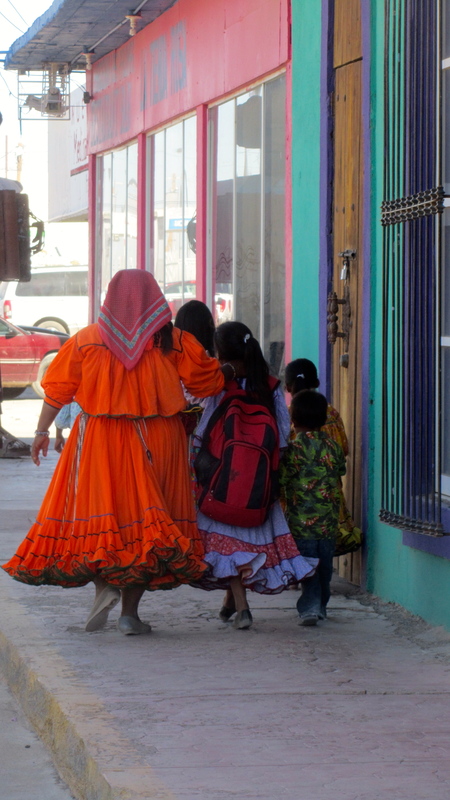 I learned that many people come to Mexico to have medical procedures done. 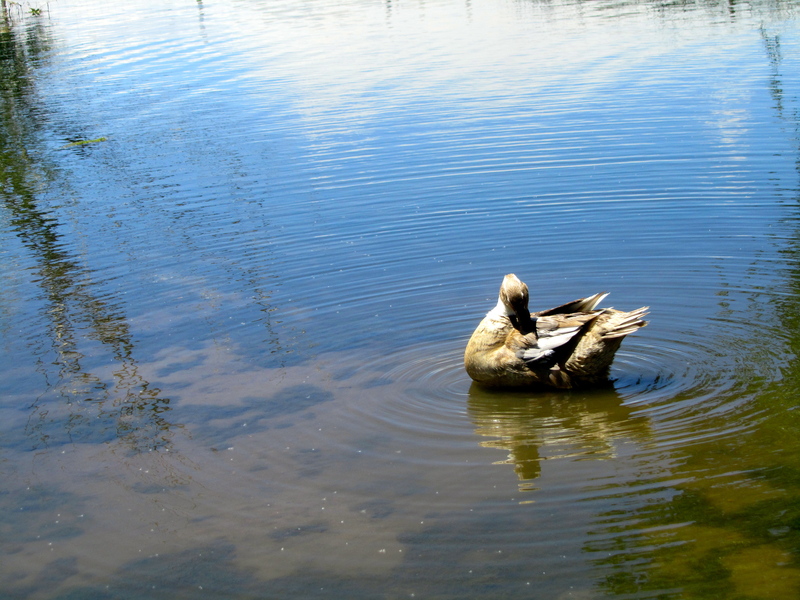 Being a duck, I don’t worry about dental and vision problems, but humans do. Leaving the main shopping and tourist area, we walked to the park. 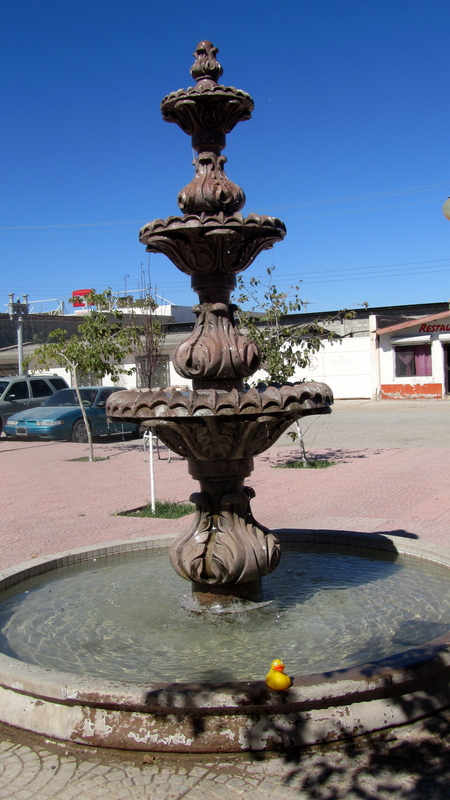 Most Mexican towns have a large plaza in town. Sometimes this is called the alameda. 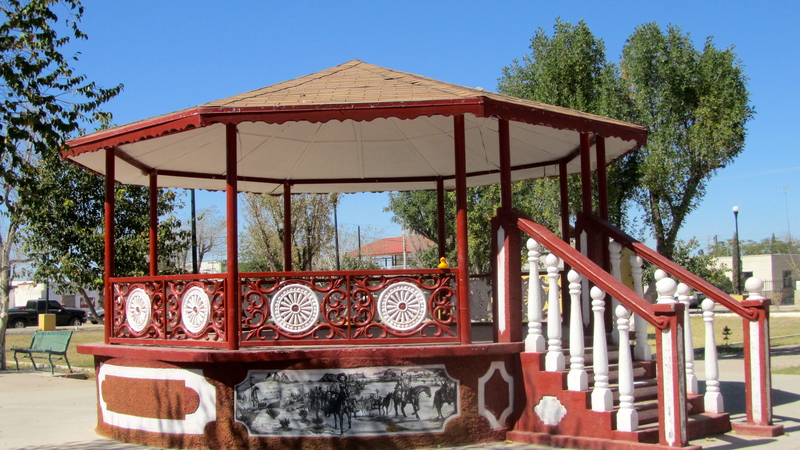 In Palomas this plaza is very pretty and there is a large gazebo in the center. Lots of grass and trees here and sidewalks leading to the gazebo. I love these plazas. 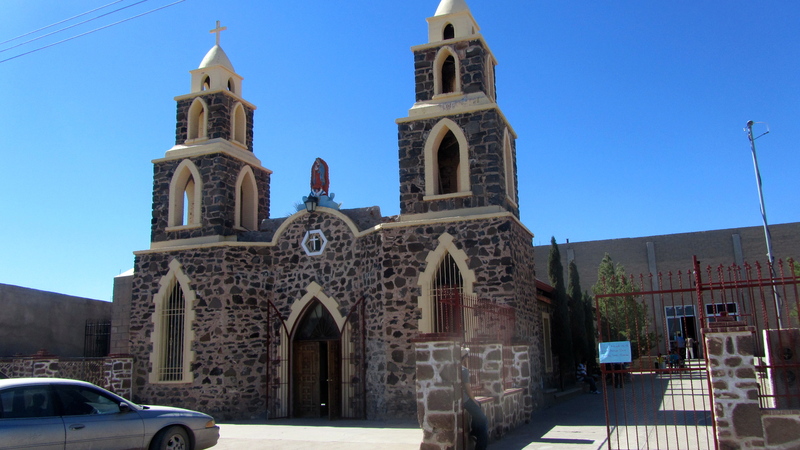 Across the street from the plaza is an old church. We were there Sunday, and mass just ended as we arrived. Everybody looked so nice coming out of the church. A few blocks from the plaza we saw this statue of a horseman. A large statue but the sculpture had great detail on it. I felt proud to be here. I know that people are concerned about safety going to Mexican border towns now, but mom and I felt very safe here. Everyone was very nice. There were several Americans in town. Some drove here but most like us, walked across the border. 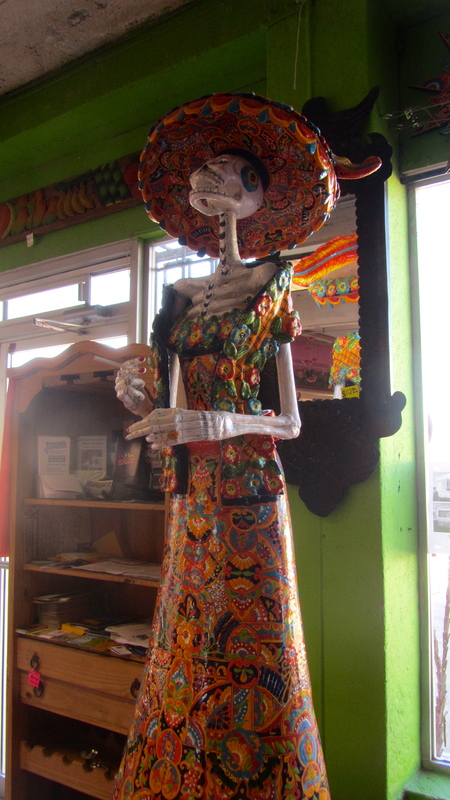 If you are near Columbus, New Mexico, I hope you will come to Palomas. We had a wonderful time here and I know you will enjoy it also. 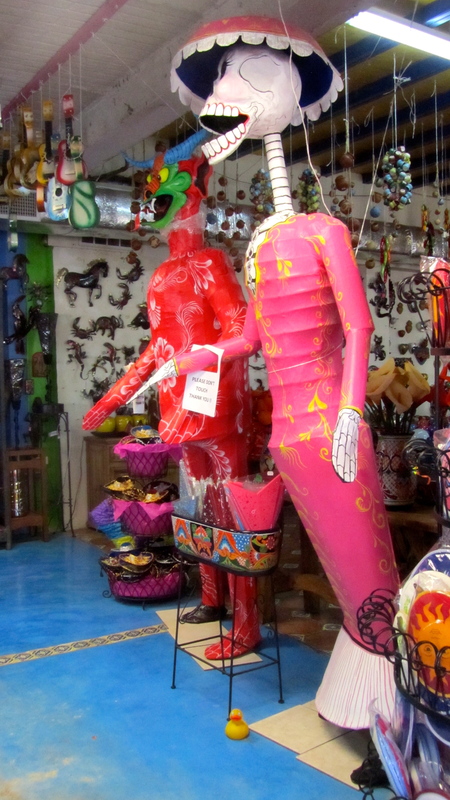 Come to eat, come to shop and come to enjoy the city of Palomas, Mexico. 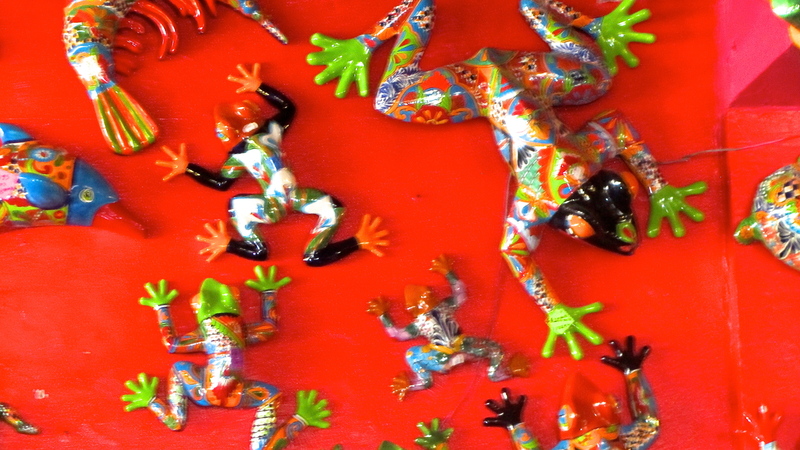 Look at www.palomasmexico.com for more information. My humans took me to New Mexico. The NRA Whittington Center is 33,000 protected acres. 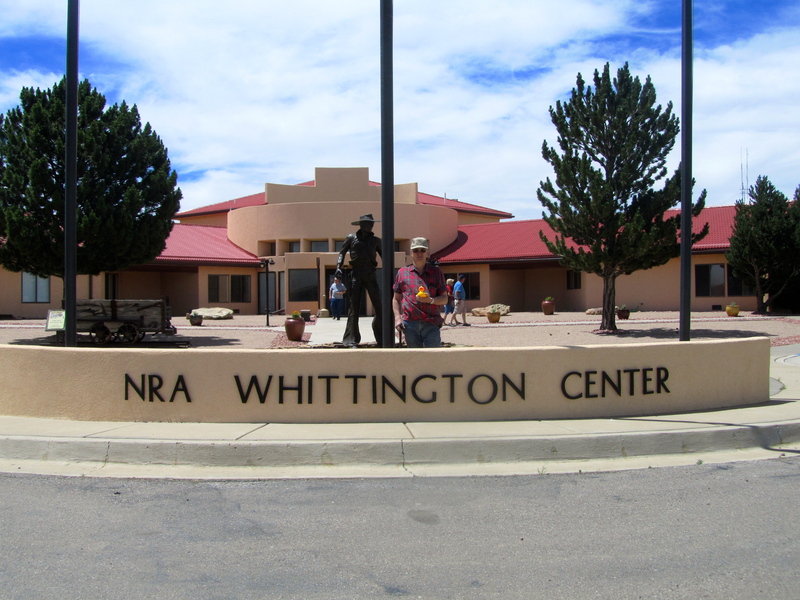 NRA Whittington Center at Raton New Mexico. Zeb and Alaska uncle. Within the property, we can shoot on several ranges, we can hunt at certain times of the year and in certain areas, we can hike, ride bikes, drive almost abandoned roads, including those through a former coal mining town. 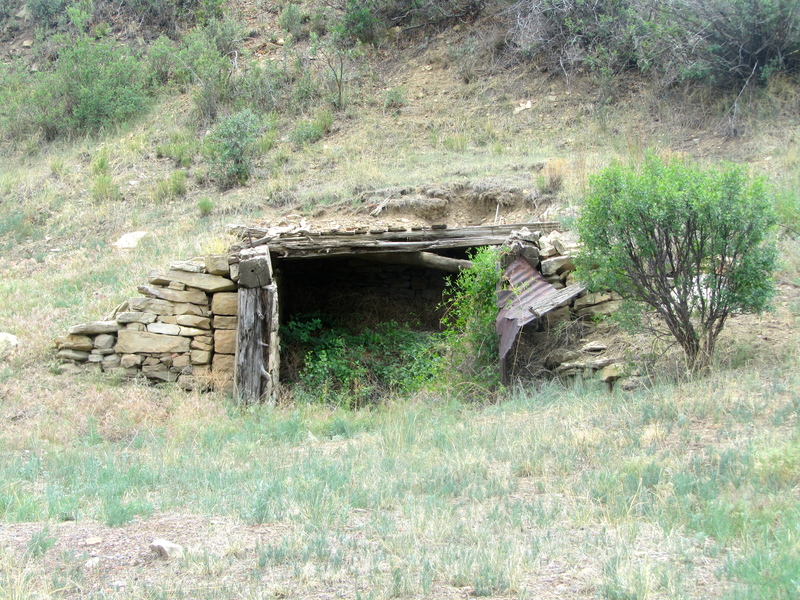 This tunnel is left from coal mining operations. 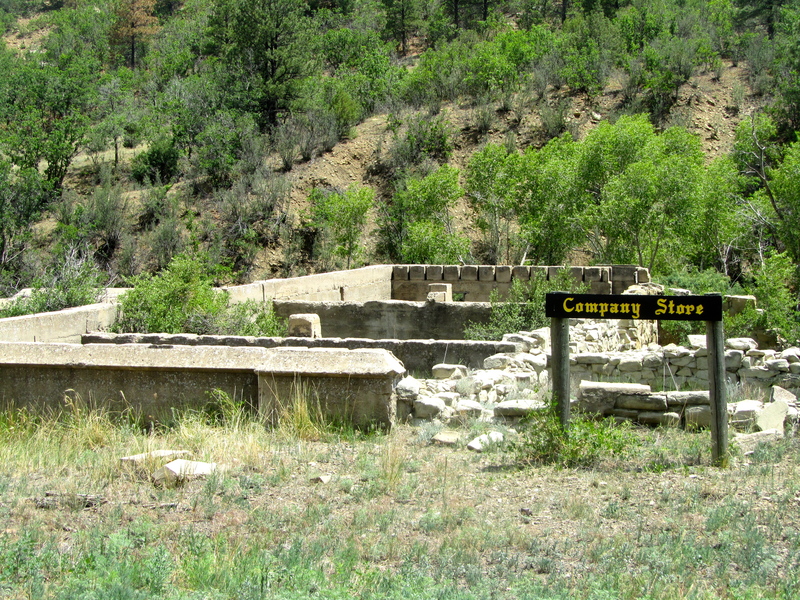 We even stopped at the remains of the company store. We could use primitive campsites, RV campsites with water and electricity or stay in guest accommodations with dining facilities. 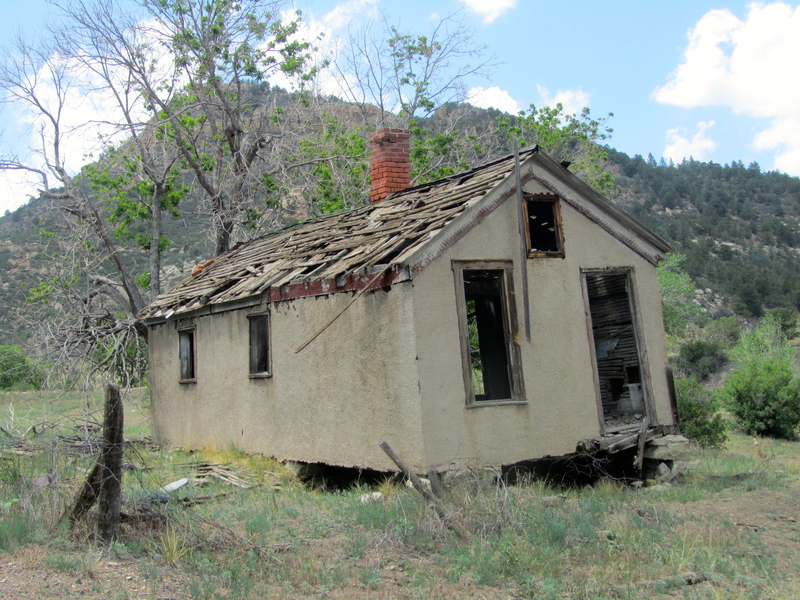 My humans got us a room in Raton, New Mexico. The Whittington Center has Adventure Camps for young men and women. We were there to celebrate 25 years of Adventure Camp. One evening we had a chuck wagon dinner in Coal Canyon. Good food and lots of reminiscing about previous years. Also enjoyed the beautiful setting, surrounded by mountains and beautiful blue sky. 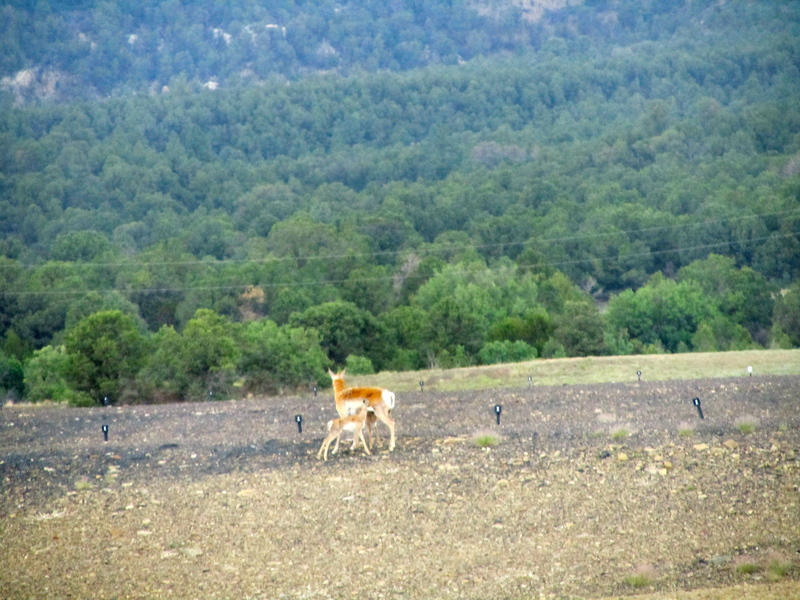 On the way out of the canyon, we saw these deer. 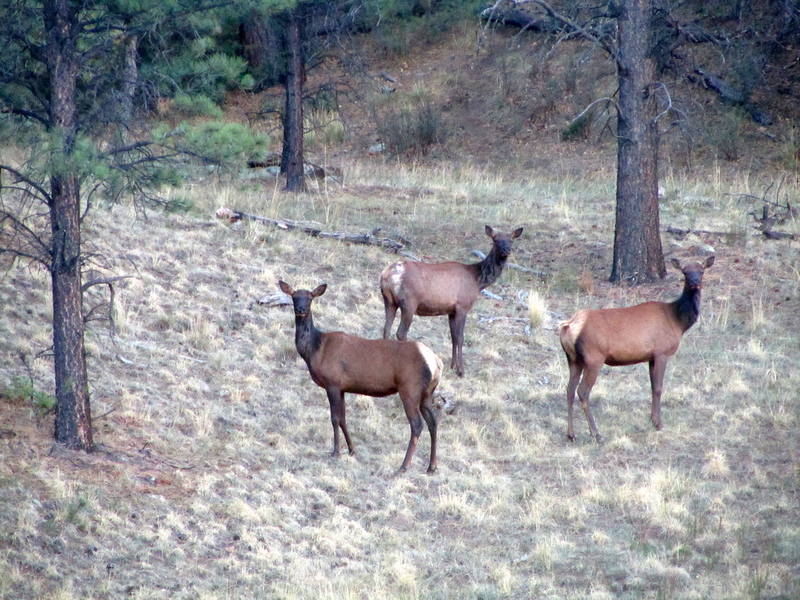 They seemed to enjoy watching us as much as we enjoyed seeing them. 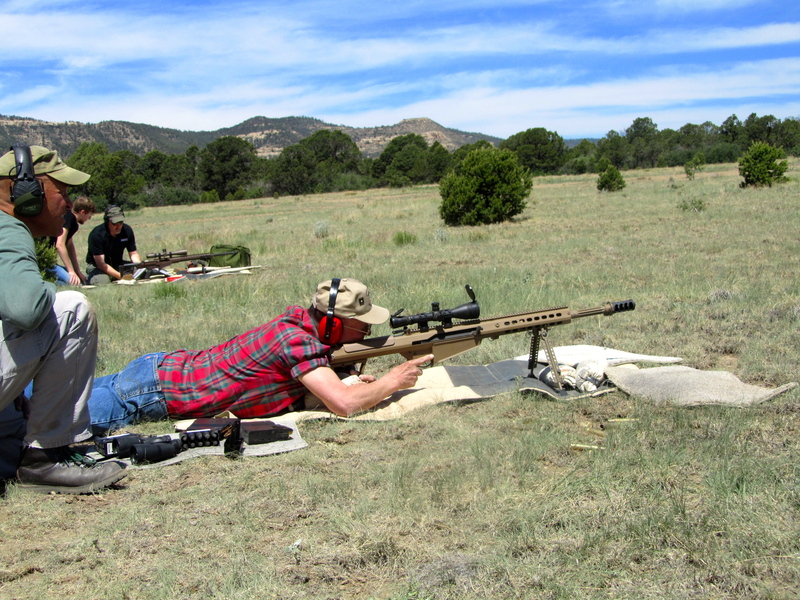 and the 338 Lapua Mag rifle. He kept one empty shell casing from each rifle. They are very large. The noise was so loud; it set off the alarm on our car. No reason to lock car out there, so that solved the problem. One afternoon at a different shooting range at the Whittington Center, a representative from Glock Firearms provided Glock pistols and lots of ammunition. The targets looked like 5 speed limit signs. 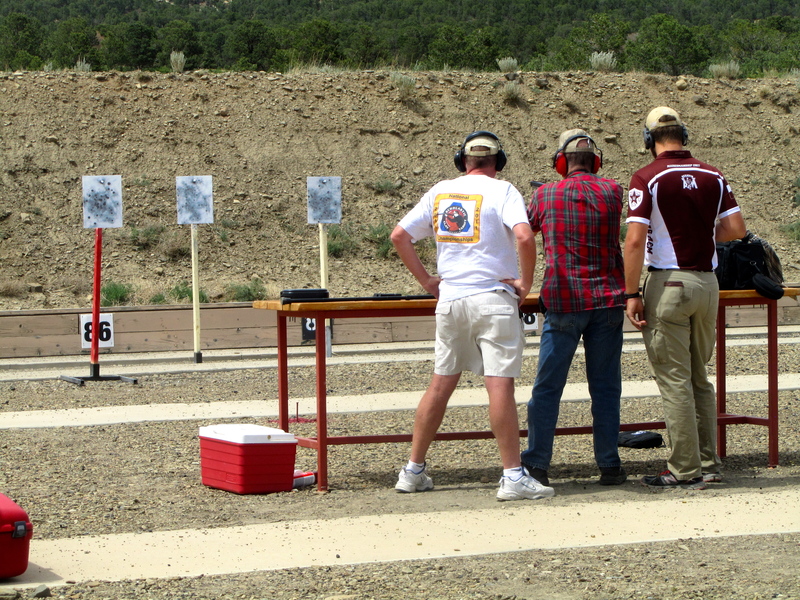 The shooters had to shot and hit each target in a certain order. They were timed on this event. They shot target one, then two, then five, then four and last target 3. Two of my humans did this. My Alaska uncle did very well and my Colorado mom was good. She hit the targets, but was a little slower than my uncle. Both did well and had fun. The humans all wear ear protection, but my duck ears really heard the noise. When the shooting ranges are not in use, this baby antelope with mom decided it was snack time. At the final evening banquet, my Alaska uncle won a door prize, eye protection glasses for shooting, or for using power tools. My Colorado mom has these glasses she uses when cutting branches with a small electric chain saw. My uncle seems to win a lot of prizes at these conventions. Previously he won a gun safe and another time, he won a gun. Mom won nothing. Lucky she has me. 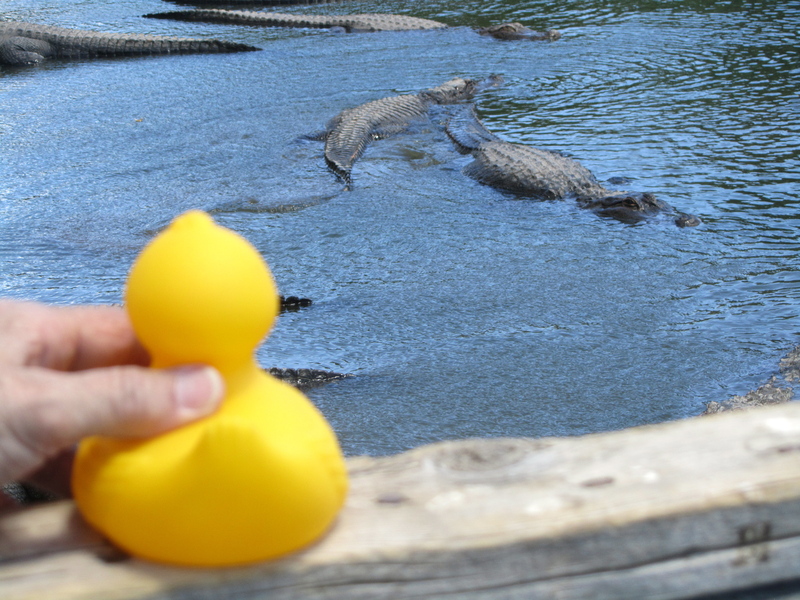 Alligators are not usually a duck’s best friends, but this was fun—and a little scary for me. 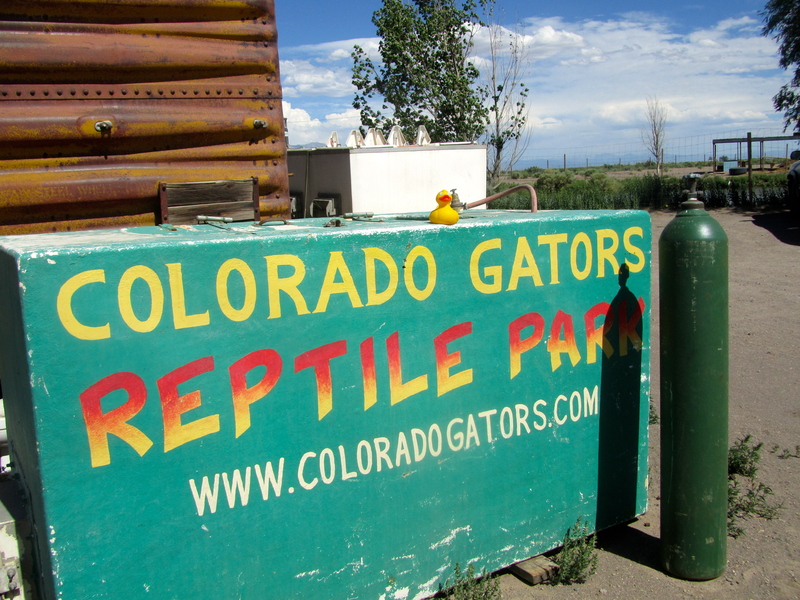 North of Alamosa, Colorado, we visited the alligator and reptile farm. I saw lizards, snakes, turtles, even an opossum, fish, and many alligators. These guys started a fish farm raising tilapia, and needed a way to dispose of the fish waste. They brought a few alligators to be the garbage disposals. The alligators reproduced, the pubic wanted to see the alligators, so these smart guys charged people to see the alligators. Then sold food to feed the alligators. Also the alligators took care of the unwanted fish parts. And the place just keeps growing and they are still raising and selling tilapia. These are smart, and very nice, businessmen. 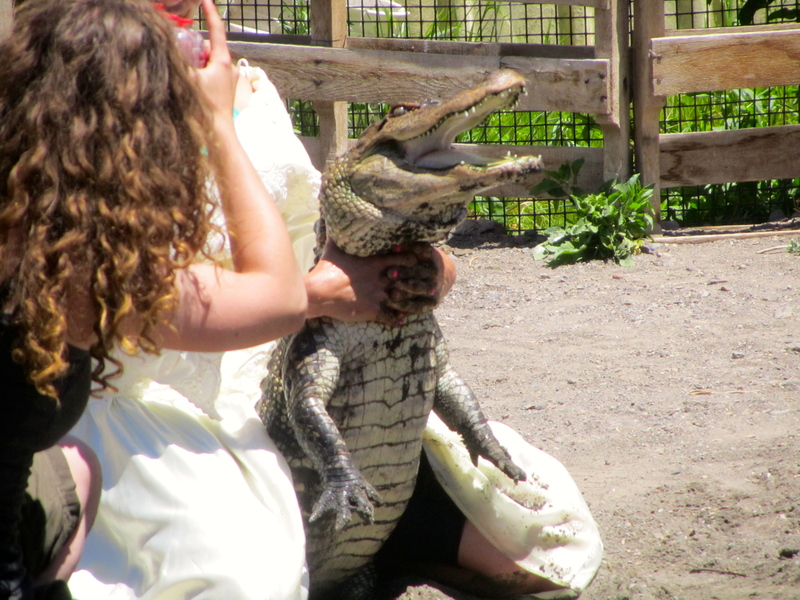 Soon after paying the entrance fee, my humans were holding alligators! 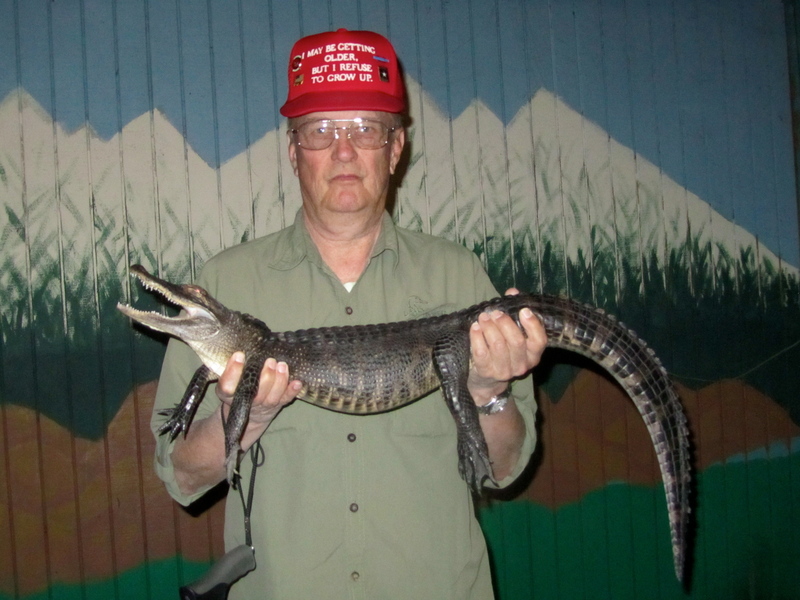 My Alaska uncle with an alligator!! 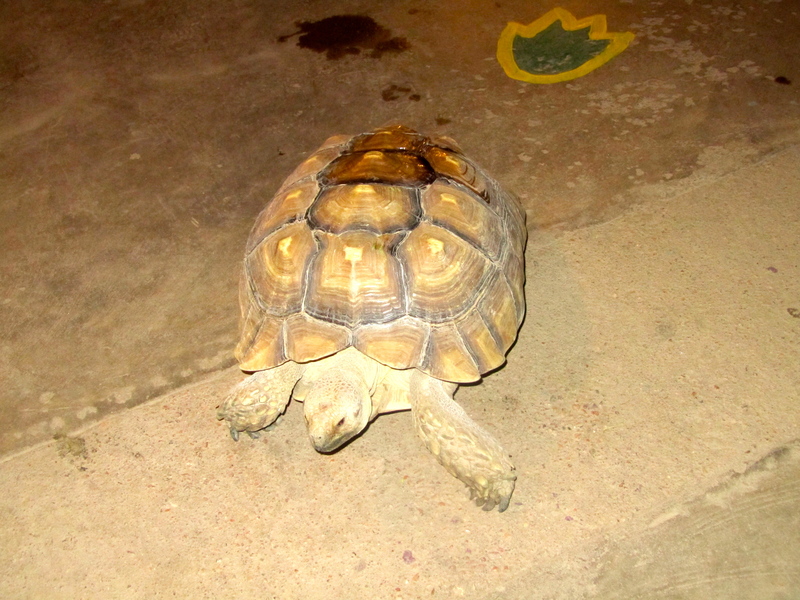 were wandering the reptile area. Hot and tropical in there. 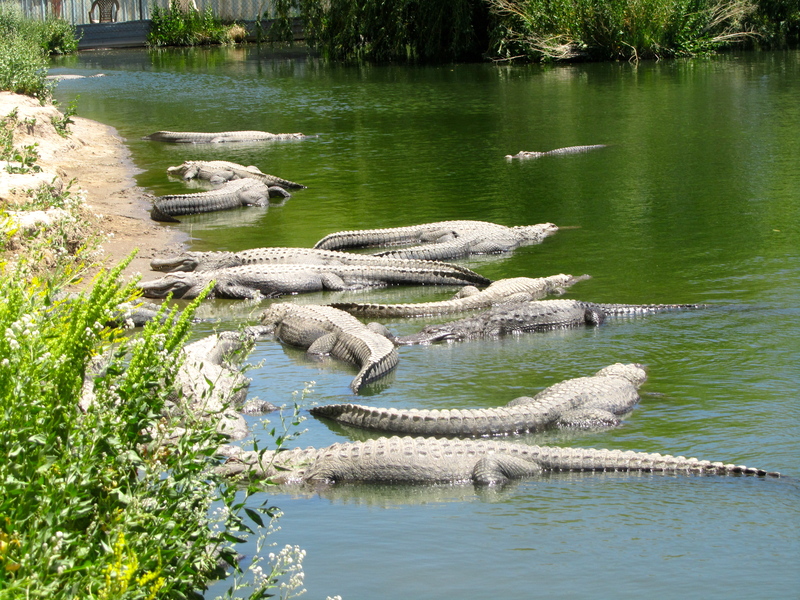 Outside alligators were in enclosed lake areas. The gators loved the alligator food tossed to them. Looked like big chunks of Purina dog food to me, but I was happy the alligators liked that food and were not looking at me as a snack. 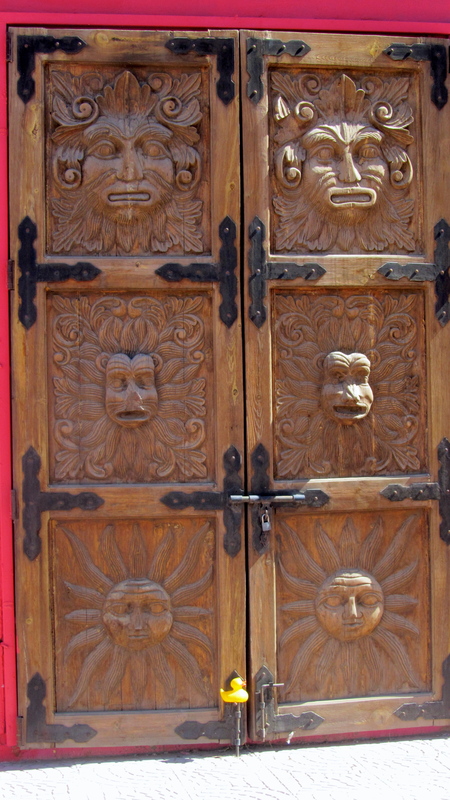 Let’s talk about unusual human behavior. There was a group of girls, and a guy. This was a wedding party and the bachelorette party (Yes, the bride and attendants) came to wrestle alligators. With an employee guide, into the water a young lady goes. Drags the alligator out by his tail. Sits on the alligator, holds him under the chin and pulls his head up. She is a very brave bride!! My, alligators have big mouths! Was fascinating to watch, but my humans stayed with me, outside the alligator area. An alligator movie star, Morris, was present. Morris the alligator starred in several movies made in Hollywood, including Happy Gilmore. 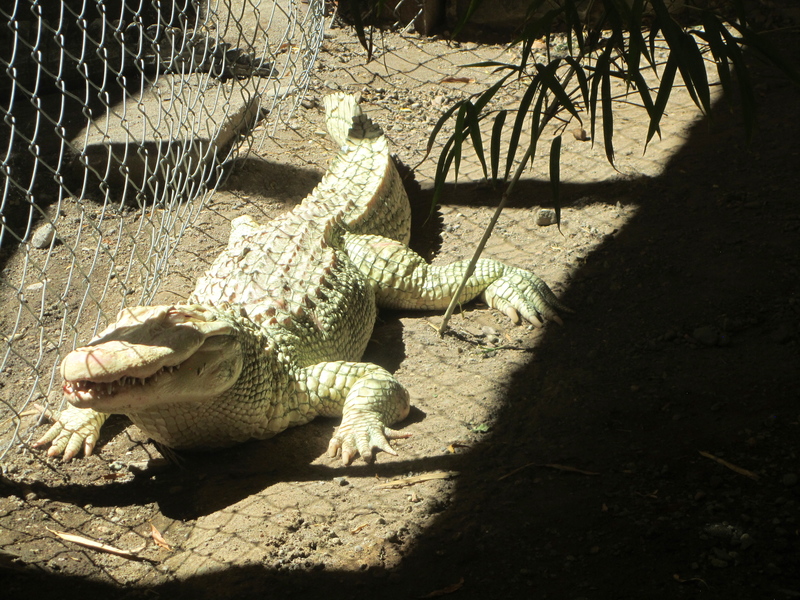 Near Morris was the white albino alligator. This made a nice change for me. Didn’t look as threatening as all the green/black alligators. Still had a big mouth full of sharp teeth though. 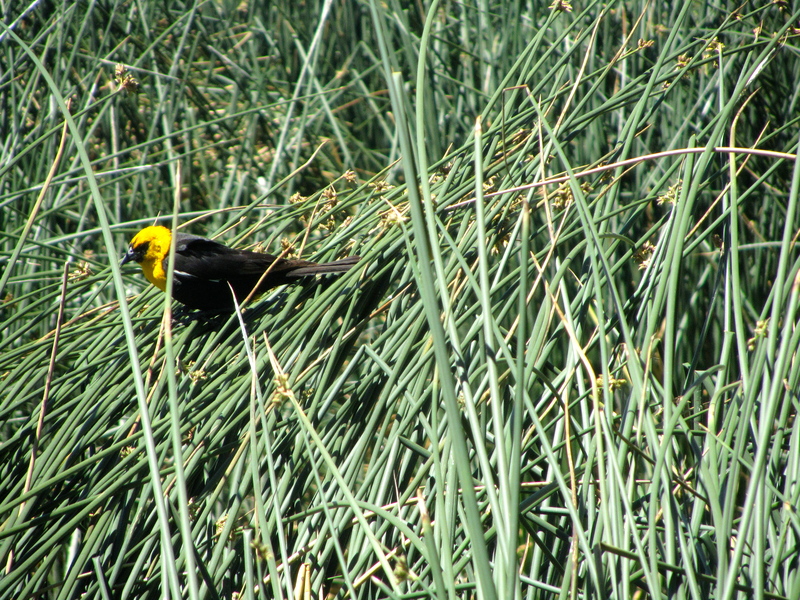 Walking along paths by the alligators, we saw this colorful bird. I thought this blog needed some of my feathered kind, so here are a few. Even a wild duck, perhaps a distant relative. 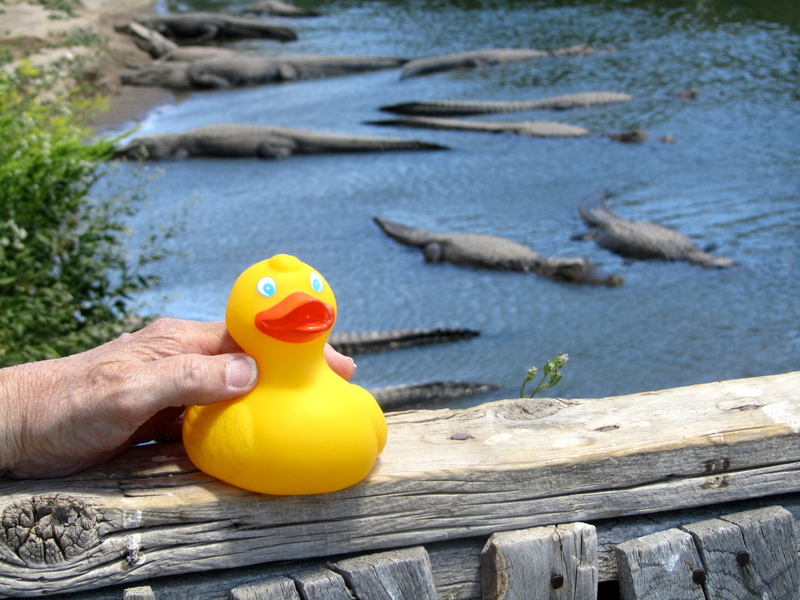 An alligator farm in Colorado is just too weird to miss. You will enjoy the experience. I did and didn’t even come close to being their snack. Visit www.coloradogators.net for more information. WOW!! 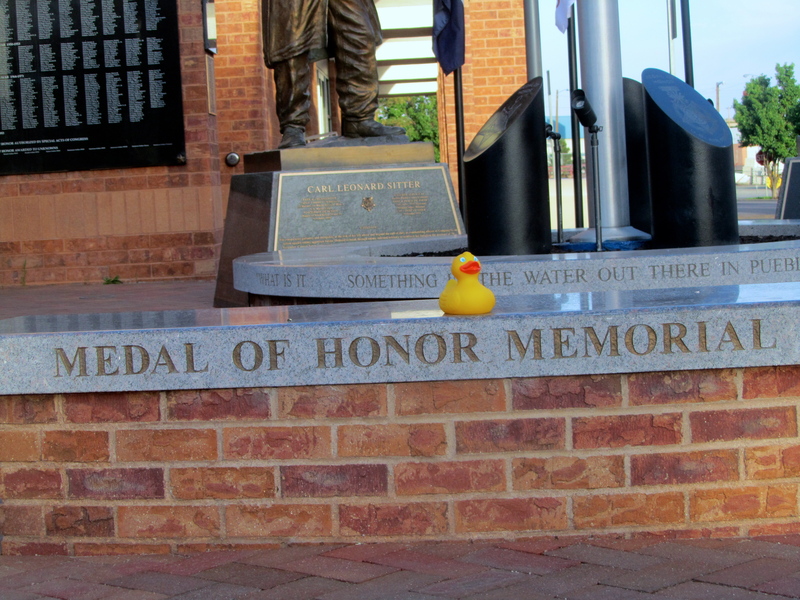 Zeb the Duck visits the memorial to 4 Congressional Medal of Honor recipients. 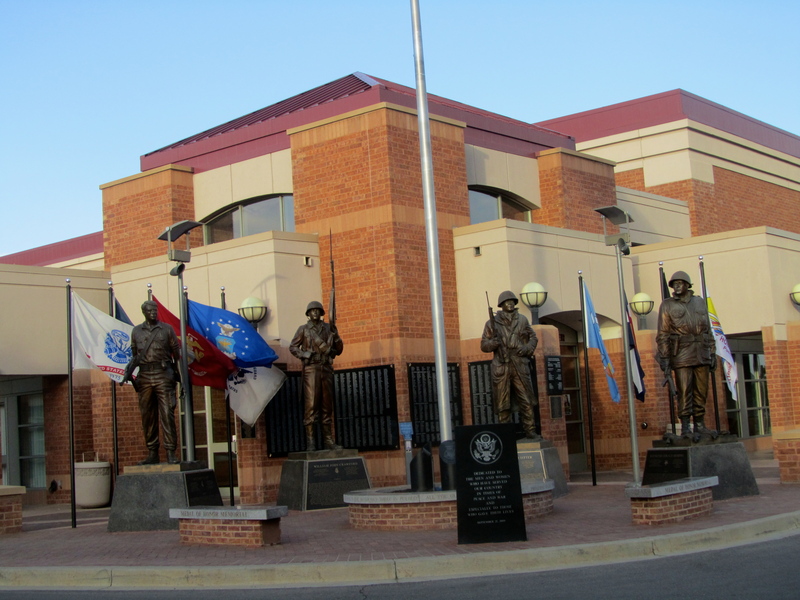 At the time the monument was built, Pueblo, Colorado was the only city to have 4 living Congressional Medal of Honor recipients. At the entrance to the Pueblo Convention Center, I saw 4 statues dedicated to 4 American heroes. William J Crawford, a WWII veteran enlisted in the US Army. Raymond G. “Jerry” Murphy, a Korean conflict veteran, a US Marine. Drew D. Dix, a Vietnam War veteran, enlisted in the US Army. These soldiers and many others helped make the United States of America a great country. 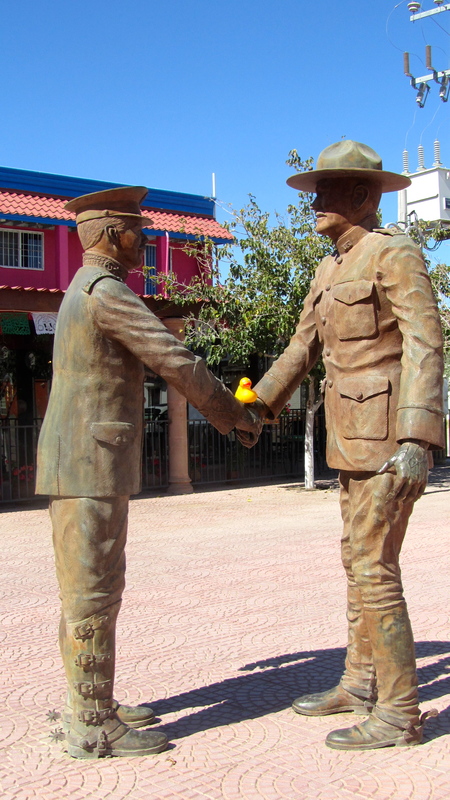 Zeb and all Colorado Traveling Ducks are in awe of their accomplishments and service. Thank you all military persons, active and veterans. 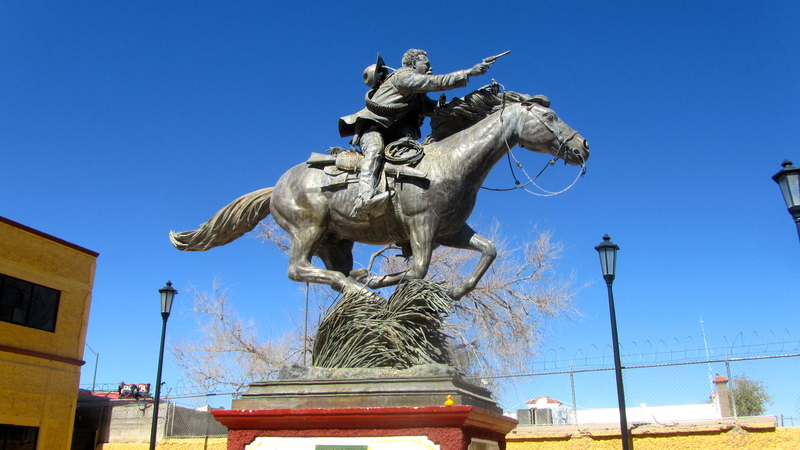 This memorial is located in Pueblo, Colorado. 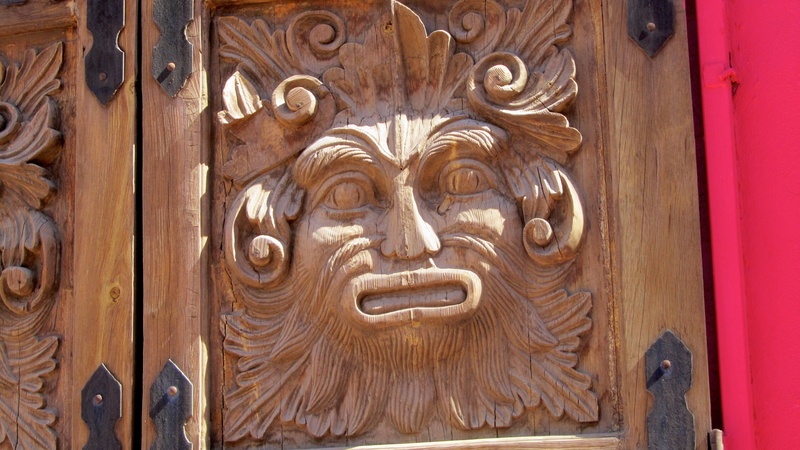 It is just a short distance from I-25, near the River Walk. I am proud to be an American duck and to have visited this memorial. You will want to see it also and enjoy the river walk.